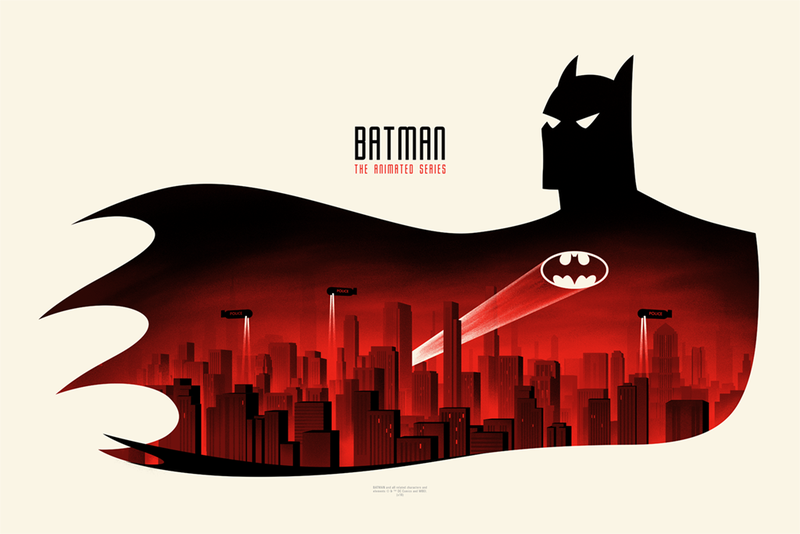 Batman: The Animated Series artwork from Justin Erickson. Artist Justin Erickson has been immersed in the animated version of the Dark Knight’s hometown of Gotham City, doing his damnedest to pay tribute to an all-time classic superhero television show. Last week in Austin, Mondo Gallery hosted an art show centered on Bruce Timm and Eric Radomski’s Batman: The Animated Series, featuring work by Erickson and previews of Mondo’s upcoming one-sixth scale action figures. I interviewed Erickson on opening night and in the talk that follows, the artist discusses the challenge of finding his own take on Bat-work that’s already been executed at such a high level. io9: Let’s start with the most obvious question. Why Batman and why the animated series, why not the Burton movies or Nolan movies or why this specific iteration of the characters? Justin Erickson: Well, for me it’s my favorite Batman of all of them. Including the comic books, Nolan, everything. I think it’s just the truest version of Batman and has the best everything: the best Bruce Wayne, the best Alfred, the best Batcave, the best car, the best villains. They had three, four seasons to get it right and all the characters are so fully realized and rendered. io9: The pieces navigate a really interesting tension between hewing very closely to that Bruce Timm aesthetic but also edging a little bit more toward classic illustration or superhero styling. Why did you decide to choose this particular interpretation of the figurework? Right off the bat, when they asked me to do stuff based on the animated series I knew that I couldn’t get away from a Bruce Timm style. His artwork is the DNA of the show so I wanted to pay tribute to that but not copy it. I felt it was more of a tribute to him if I didn’t copy his work, to see what I could do with it on my own. The show has such a great style and look to it; I wanted to challenge myself to put myself into it too. io9: Why these particular episodes for these pieces? They’re all standouts. Part of the reason why the show is so well-beloved today is because they treated almost every episode like a tiny movie. The pacing is so tight in them they don’t feel like 25 minutes; they feel like a whole movie. The storytelling is so good and tight and they had such a wide breadth of stories. It wasn’t just like “villain threatens Gotham, Batman takes them out.” There’s always something to it like “Trial,” where they do the idea that’s run through all of Batman’s iterations: Who created who? Did Batman create the villains or did they create Batman? So they put him on trial in Arkham because this new DA thinks that Batman is the problem. 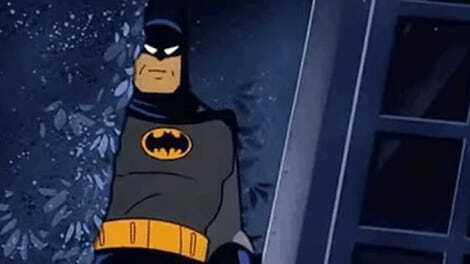 So the whole episode is based around the idea of who made who and the ideas that they made Batman not been around. Well, originally we wanted to do the “Heart of Steel” HARDAC episode but I was always more pulling towards “His Silicon Soul.” “Heart of Steel” is a Blade Runner-esque episode that was great and amazing but my choice was always “His Silicon Soul.” It took a chance to look at Bruce Wayne more deeply. HARDAC made me a perfect Batman clone that was too perfect. He wouldn’t kill anybody. I loved that. io9: And “Demon’s Quest.” Why pick that episode? If we’re going to do a Ra’s Al Ghul episode, it is the better one. We chose an Indiana Jones-style poster because the episode is basically like in that same vein of pulpy ‘40s adventure movie. They even have the dotted line [when the plane is flying across the map.] You know it’s so right in there. It’s a really great larger-than-life crazy big story. Erickson’s piece on Mask of the Phantasm. io9: It’s interesting looking at your piece for “On Leather Wings” because that was the pilot and the show wound up looking so different. Talk to me about drawing the character and the way that it’s rendered in the episode and then changing it up as you did different pieces. That was one of the first ones I did. I got more comfortable with the character and how the style actually evolved, getting to a place of thinking how Batman looks in the first few seasons and how it changed over three or four years. io9: Do you have a favorite villain? It’s kind of funny, you can’t really answer that question without also talking about your favorite voice actor from the show. Every single one was amazing. As Ra’s Al Ghul, David Warner did the perfect characterization. Mark Hamill as the Joker, for example. He is the Joker, more than Jack Nicholson, more than Heath Ledger. He is the Joker, to me anyway. That’s my opinion. Right. But, for favorite villain, I’ve got to say Mr. Freeze. The voice acting is so moving and they really changed him from the comics and made him a really tragic character. “Heart of Ice” begins and ends with a monologue by Victor Fries and shows how tortured and dark he is. He has nothing left to love in the world so he’s going to make everybody as cold as he is. It’s just a really great character. Tragically, I think he’s underused but I think they use him just enough. He couldn’t be like the villain of the week. He was never like Joker, just causing mayhem and havoc. He had a very direct plan of attack: revenge. io9: How did you fight the temptation to just to copy the series’ great title cards? It was hard. That was hard to work around because, sometimes, the title card was so succinct. There was always that back-and-forth, push-and-pull. “Should I take inspiration on this or should I just avoid it entirely?” Eventually, what I comfortable with was not out and out avoiding it, but not copying them directly. But I always try to let the episode dictate what the art needed. Like, for example, “On Leather Wings.” It’s a 1950s monster movie so that kind of guided the inspiration, like with “Demon’s Quest” and Indiana Jones. 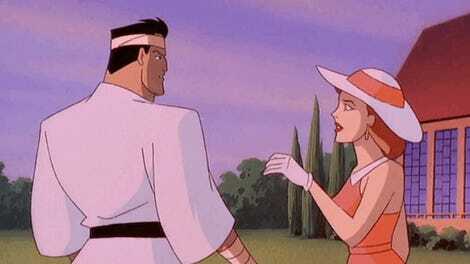 Correction: an earlier version of this article said that Maurice LaMarche did the voice of Ra’s Al Ghul. That was my mistake, not Justin’s, and I regret the error.